DENVER—"Chonda Pierce: Laughing in the Dark," a one-night only cinema event, presented by Fathom Events and Fuseic Entertainment, will premier in select theaters around the country Tuesday, October 27, at 7 pm (all time zones). A deeply personal glimpse into the life of Chonda Pierce, the groundbreaking Christian humorist and best-selling female comedian of all-time, the film chronicles a series of tragic circumstances she recently faced, including the loss of her husband. Leaning on her faith in a season of heartbreak, Pierce perseveres—her signature wit always intact—hoping to inspire and encourage others with her story. Immediately following the film, theater audiences will have the opportunity to view a special post-event presentation, “Finding Light in the Darkness.” Various celebrities and public figures, including Roma Downey, Kevin Sorbo, Sherri Shepherd, Monica Crowley, Corbin Bernsen and “Duck Dynasty’s” Miss Kay Robertson, are slated to discuss the impact of Pierce’s story. Audience members can submit questions in advance by emailing question@chonda.com. Andrew Tenenbaum, Pierce’s manager and producer of the film, adds, "This is a most special project for me, to be able to tell the true story of my dear friend Chonda in a way that will connect with millions who can find strength, courage and survival... and hopefully a few great laughs." 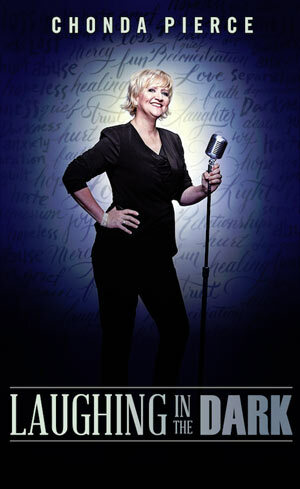 Tickets for “Chonda Pierce: Laughing in the Dark” can be purchased online at fathomevents.com, or at participating theater box offices. The event will be offered in nearly 480 movie theaters in Fathom’s Digital Broadcast Network. For a complete list of theater locations, visit fathomevents.com (theaters and participants subject to change). About Fathom Events Fathom Events is the recognized leader in the alternative entertainment industry, offering a variety of one-of-a-kind entertainment events in movie theaters nationwide that include live, high-definition performances of the Metropolitan Opera, the performing arts, major sporting events, music concerts, comedy series, Broadway shows, original programming featuring entertainment’s biggest stars, socially relevant documentaries with audience Q&A and much more. Fathom Events takes audiences behind-the-scenes and offers unique extras, creating the ultimate entertainment experience. It is owned by a consortium called AC JV, LLC., comprised of AMC Entertainment Inc. (NYSE: AMC), Cinemark Holdings, Inc. (NYSE: CNK) and Regal Entertainment Group (NYSE: RGC), the three largest movie theater circuits in the United States. In addition, Fathom Events’ live digital broadcast network (“DBN”) is the largest cinema broadcast network in North America, bringing live events to 820 locations in 177 Designated Market Areas® (including all of the top 50). For more information, visit fathomevents.com. About Fuseic Entertainment Director Rick Altizer and Producer Kent Songer launched Fuseic Entertainment in 2002 as a developer of proprietary music, animation and film projects that encourage, edify and strengthen faith and belief for individuals and families. To view the official trailer for “Chonda Pierce: Laughing in the Dark,” visit laughinginthedarkmovie.com. For further information, visit turningpointpr.com.